From the dawn of history, taxing authorities have been formidable partners of commerce. This timeless burden has reached levels of great complexity in today's environment. The tax staff at DeSena & Co. CPA's provides the energy, optimism and vision required to meet this challenge. 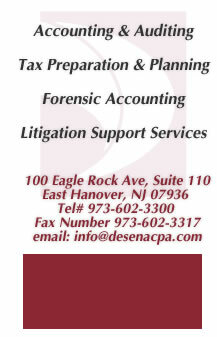 Our firm offers professional preparation of all federal, state, and local tax returns at competitive, affordable rates. We also offer a full range of tax planning and compliance services. We will work with you year-round if necessary in order to minimize your total tax burden. We offer these services for individuals as well as Partnerships, Corporations, S-Corporations, Limited Liability Companies, and Estates and Trusts. Our firm continuously monitors federal, state, and local tax law changes to allow its clients to minimize current and future tax liabilities. If necessary, we can implement tailor-made due-date tax compliance monitoring systems to prevent costly interest and penalty assessments attributable to late filing. We prepare all federal and state filings required for not-for-profit entities. Our firm provides expert preparation of federal and state estate, gift, and trust tax returns. We also offer estate planning services so you can minimize both federal and state estate tax liabilities. We will endeavor to protect your heirs from the unneeded emotional devastation that can be caused by estate tax levies. We can assist you with all types of reorganizations and corporate liquidations.